You as a horse owner are a breed of your own. Whether you have thoroughbreds or your horse is a beloved family member, your horses require a large investment of time, attention, and finances. And because of this, we want to make sure your investment pays off by having you choose our patented Thermotex Horse Blanket for all of your horse’s needs. It’s soothing, deep heat (delivered through FAR infrared thermal energy) penetrates beneath the surface of your horse’s skin delivering much-needed pain relief and relaxation. Your horses deserve the best. 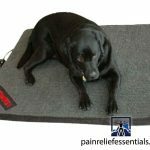 They also deserves to be free from lactic acid build up in their muscles, to relieve soreness from any injuries, to eliminate inflammation of the joints from arthritis, and to do away with sinus inflammation…all of which can happen with the use of the Thermotex Horse Blanket. You’ll find that your horses will showcase shinier hair due to the blanket’s ability to bring out the natural oils in the skin. What do horses experience? Let your horses experience warm, generous heat that soothes stiff muscles and aching backs for however long is wished, …there are no adverse side effects and no overheating. Safe, effective, comforting…all the things you would wish for your valued family member. Don’t miss out on the lowest price available! We are able to ship the blanket to you direct from the manufacturer in Alberta, Canada, by DHL Air Express. For delivery in the United States, your package will normally arrive within 2 to 3 business days. You do not need to choose priority shipping for this product as this is already the fastest delivery option available! Purchase of the Thermotex Horse Blanket includes the book “Helping Horses Heal” (MSRP $29.95) with our compliments. 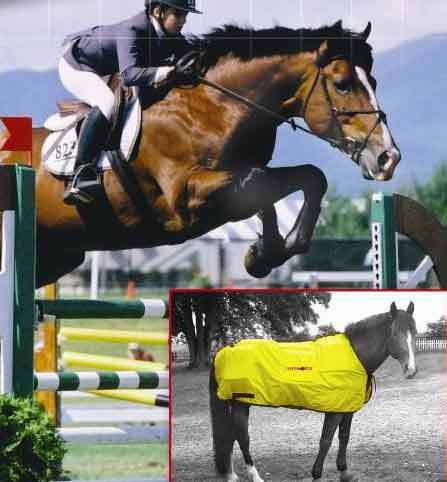 With our Free Shipping, your horse blanket will usually arrive withing 3 business days (often next day for morning orders) to locations within the United States. Because we are happy to offer the Thermotex Infrared Horse Blanket at the lowest price available, it is not eligible for discount coupons. 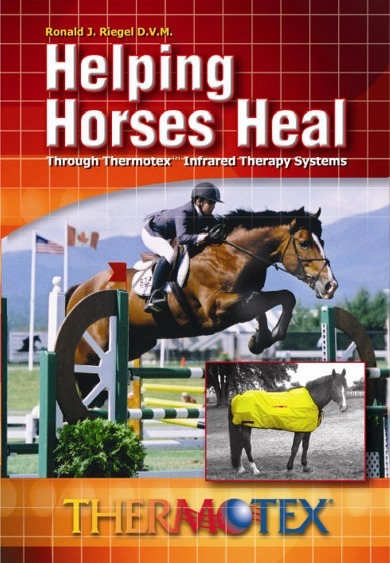 Download Thermotex Infrared Equine Therapy vs. conventional heating pads and hot towel for racehorses. Product ships from Manufacturer direct to you by air. Warranty: One year on parts and labor. 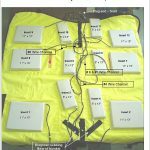 The Thermotex Infrared Therapy System is the best heat producing therapy device on the market and it is important that you use it properly to achieve maximum results. With temperature setting on high, allow the blanket to pre-warm for a at least five minutes, . Unplug the blanket and then place it on the horse. Securely fasten the infrared blanket on the horse using all the Velcro straps. The blanket should fit snugly on the horse. Using a good quality extension cord, plug in the blanket while making sure that the cords are out of the way of the the horses head and all four hooves. Set the temperature setting to high for the first 10 to 15 minutes of the therapy session. Check to make sure that all of the heating pads are in their pockets. After the first 20 minutes of use the infrared heating pads can be moved within their pockets to further treat that anatomical area. Therapy sessions should normally last at minimum of 30 minutes. When treating a clinical condition, infrared therapy sessions can last for an hour or more. Long therapy sessions are not uncommon when using a Thermotex Infrared Therapy System Blanket. 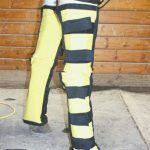 The patented infrared pads will not overheat the tissues and will not cause the dehydration of any of the body fluids from the horse. 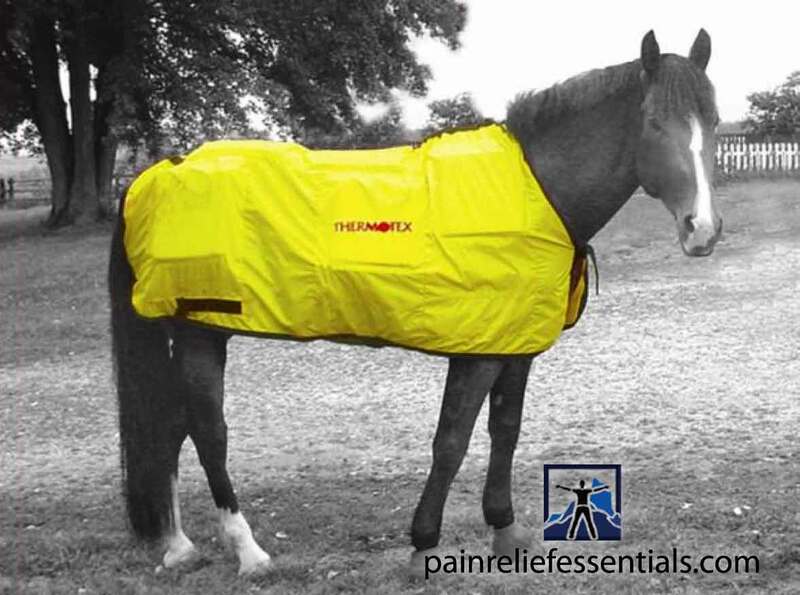 In cases of severe myositis, The Thermotex horse blanket has been used for up to eight hours in a 24-hour period. This was in a cold climate and had only beneficial results to the horse. – From "Helping Horses Heal" – Page 25. When the therapy session is over, remove the blanket and wipe it clean with a disinfecting cloth. Allow it to dry out completely before storing. Use a light to medium towel to dry any areas of perspiration off the horse and lightly massage any areas that are sore.